The Easter Dresses. Repurposed from this. The skirt is the same process as the Evening Empire Dress Pattern, which is really the same process as the quilts too. For the bodices I just generally made rectangles to fit each of the girls. Eleni's (top) gathers up with the skirt by way of two elastic channels. Isabela's has a triangular detail in front and only gathers up with elastic in back. And has crisscross straps. A requested feature. 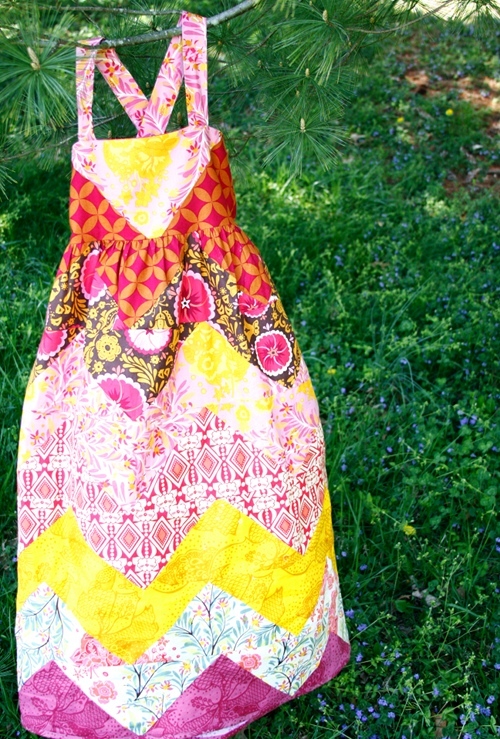 I don't think I have to tell you that I am smitten with spring, sewing, zigzag patchwork or little girls. But I have to tell you (must) that I am blown over by how gorgeous the outside is currently. Not popping bulbs or planted flowers or tended gardens actually- but the amazing landscape that is the green grass right now. It looks like a raucous party of dandelions, clover, violets, and all sorts of other uninvited guests. Parties are always best when crashed. Smitten I tell you! Which reminds me, I'm not sure the littlest girls know how to make a dandelion necklace. D-a-n-d-e-l-i-o-n-N-e-c-k-l-a-c-e-s. There. On this weekend's list. I too am smitten with these beautiful dresses. Happy Spring! Have a wonderful weekend. Spring has really sprung with you ! We were told not to pick dandelions when we were children, we were told we would pee the bed ! in fact that is what we called them. Is that an English thing I wonder ? gorgeous! We are just loving your voiles and our customers are too! This just isn't fair...how can I keep up with the inspiration you provide? I feel a desparate need to go sew one of these dresses right now. I might need more fabric...better go check! I will like to see pictures of the cute girls wearing the beautiful, colorful dresses! Oh your comments make me a little sad! This is my first spring away from Nashville ever, and it's just not so green here in Denver yet! 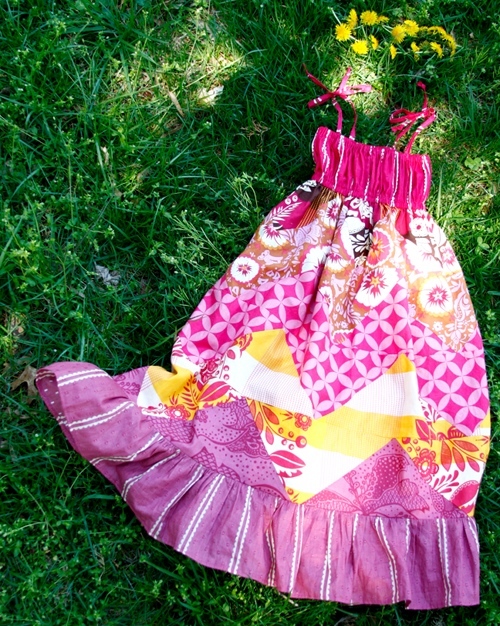 I love repurposing...such a great little dress! Hopeing for Spring here in south-eastern Idaho too! My tulips are up about 2 inches! The dobby dots next to the festival zinnia on the very first dress--oh my! I'm still making things with good folks, so many of the fabrics are truly "two in one" and look so different depending on how they're cut. And they garner compliments whenever I show them off. Totally smitten with your work, this pattern, the colors of these dresses. You have many imitators, but none of them come close to conveying your mastery of color and pattern. Pee your bed, not the flower bed ! I remember boys at school running after us girls with dandelions, and if they touched you with them or if indeed you had picked them you would pee your bed that night LOL I can not believe that that is not known worldwide !! The dresses are so colorful and beautiful!! 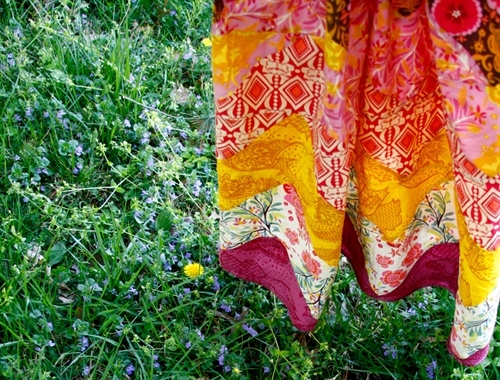 I love patchwork skirts and dresses. I remember making dandylion and daisy chains. My backyard is full of beach sunflowers and blanket flowers. I taught my grand-daughter to make flower chains one spring. I wonder if she still remembers. I'm smitten too! 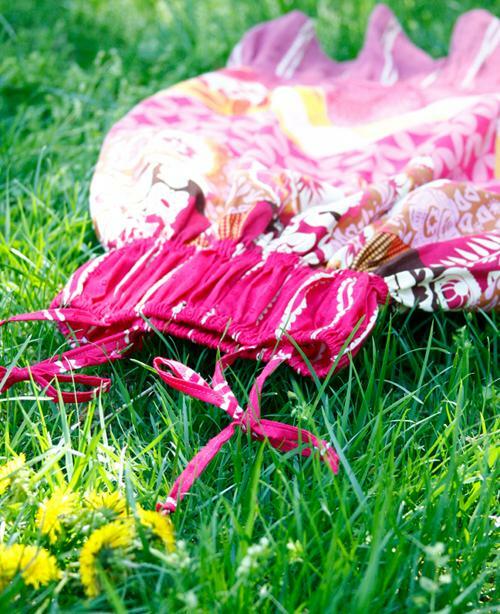 Amazing dresses, amazing grass and flowers. We're on the verge of a rose explosion on the West Coast. Can't wait. I'll be smitten over that too! Your fabrics are just so luscious. That's the only way I can describe them. Simply luscious. Ahhh, smitten is a word that just doesn't often come up in my usual NYC conversations. All the same, those dresses are so pretty. Smitten is a grand word, and worth saving for special occurences. Keep those fabric choices and that sense of style going and going. Fabulous! Unbelievably gorgeous! What lucky little girlies! 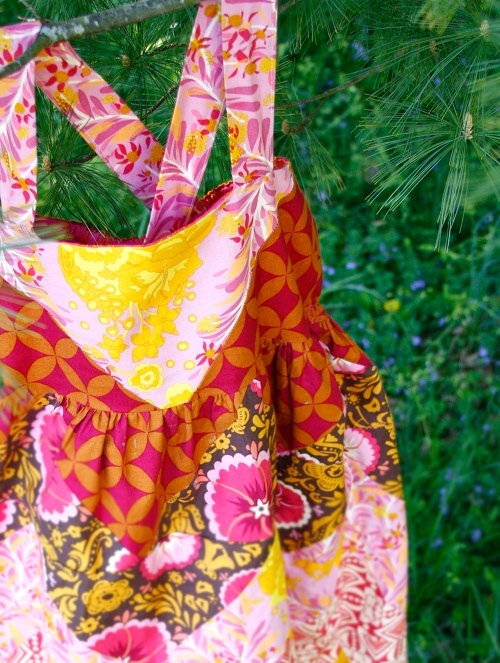 Anna Maria, I love your fabrics! "pissenlit", French word for dandelion. Salade de pissenlit et lardons (dandelion with panfried Canadian bacon bits) is a popular spring salad in France. the other French word for dandelion is "dent-de-lion" (15th century)which is the origin for similar sounding words in many languages. The English equivalent to "pissenlit" is "pissabeds", due to the diuretic properties of the plant genus "taraxacum" to which the dandelion belongs. Wow! Theresia, thanks for the great explanation of that. I wanted to buy a book yesterday called, The Naming of Names, about the origins of plant names, and I feel like you've given us a little excerpt right there! Anna Maria, those dresses are beautiful! These photos are gorgeous, with all the bright, lovely spring colors. The dress would look gorgeous with dandelion necklaces, certainly. I love them! I am hoping to see more clothing from you with your voile. I can't commit to a project worthy of how amazing your little folks is just yet. Whatever I make needs to be something that I can have close to my skin, I have never felt a more beautiful fabric. I think it is a brit thing! My mom used to say that and she's a brit! Ooh the colors <3 the beautiful beautiful colors! Oh, so fun! Now if we could actually mow our grass right now (mower needs to go in for service) maybe I could be enjoying the fresh green weediness too! I've realized recently that yours is one of my very favorite blogs, and not just because of the delicious fabric and inspiring projects... it's because your tone is so real and so friendly. Thanks for sharing of yourself in a genuine way! Beautiful!! I love the colors and it just jives so well with spring! When I was little we made dandelion necklaces but I forget how now? My mother used to put the dandelion under my chin to see if I liked butter? Do you remember that one? I'm not too far from you, and I agree - the green color that has sprouted lately is simply a delight. Does wonders for your spirit, does it not? Especially after such a grey winter. I have no little girls to make wildflower necklaces with, but I do have boys to bring me dandelion and field pansy bouquets with grass stains on their knees. Love it. I hope you have a nice day! Very good article, well written and very thought out. I agree With your point Thanks To share!!! I love the dear data you supply in your articlesresep makanan diet. I will bookmark your weblog and have my kids verify up here often. makanan sehat untuk anak I am quite sure they'll learn a lot of new stuff here than anybody else! Nice Blog and Easter Dress is really good..to looking..